CNI – EZLN: We do not forget our dead, imprisoned, and disappeared. The war against our indigenous peoples has gone on for more than 520 years. Capitalism was born of the blood of our peoples and the millions of our brothers and sisters who died during the European invasion. We must also add those who died in the wars of independence and reform, with the imposition of liberal laws, during the rule of Porfirio Diaz, and in the revolution. In this new neoliberal war of conquest, the death of our people is the condition for the life of this system. In the last few decades, thousands and thousands of us have been tortured, assassinated, disappeared, and imprisoned for defending our territories, our families, our communities, our culture – our life itself. We do not forget. Because this blood, these lives, these struggles, and this history are the essence of our resistance and our rebellion against those who kill us; they live in the life and in the struggle of our people. * Compañero Galeano from the Junta de Buen Gobierno of La Realidad and Votán from the Little School “Freedom According to the Zapatistas”, violently assassinated in the Caracol of La Realidad, Zapatista Autonomous Municipality of San Pedro Michoacán, this past May 2, by paramilitaries from the CIOAC-H, who are protected by paramilitary Manuel Velazco Coello and the supreme paramilitary leader Enrique Peña Nieto. * December 22, 1997, a group of 49 people from Las Abejas, including 4 unborn children, as they prayed in the town of Acteal, municipality of Chenalhó, were violently murdered by a group of PRI paramilitaries protected by the government of the state and by the criminal Ernesto Zedillo Ponce de León. * The murdered adults: Manuel Santiz Culebra, Daniel Gómez Pérez, Victorio Vázquez Gómez, Miguel Pérez Jiménez, Ignacio Pucuj Luna, Alonso Vázquez Gómez, Lorenzo Gómez Pérez, Antonio Vázquez Luna, María Pérez Oyalté, Marcela Capote Ruiz, Marcela Pucuj Luna, Catalina Luna Pérez, Manuela Pérez Moreno o Manuela Paciencia Moreno, Margarita Méndez Paciencia, Marcela Luna Ruiz, Juana Pérez Pérez o Florinda Pérez Pérez, María Gómez Ruiz, Verónica Vázquez Luna, Paulina Hernández Vázquez, Susana Jiménez Luna, Rosa Pérez Pérez, Antonia Vázquez Pérez, Marcela Vázquez Pérez, Juana Luna Vázquez, Juana Gómez Pérez, María Capote Pérez, Marcela Capote Vázquez. * The assassinated minors: Martha Capote Pérez, Rosa Vázquez Luna, Loida Ruiz Gómez, Micaela Vázquez Pérez, Josefa Vázquez Pérez, Sebastián Gómez Pérez, Juana Pérez Luna, Roselina Gómez Hernández, Lucía Méndez Capote, Graciela Gómez Hernández, María Luna Méndez, Silvia Pérez Luna, Vicente Méndez Capote, Micaela Vázquez Luna, Juana Vázquez Luna, Alejandro Pérez Luna, Juan Carlos Luna Pérez, Guadalupe Gómez Hernández. *Juan Vázquez Guzmán and Juan Carlos Gómez Silvano, from the Tzeltal community of San Sebastián Bachajón, assassinated on April 24, 2013 and March 21, 2014, respectively, for defending their territory in a conflict with ejido authorities and the three levels of bad government. *Filemón Benítez Pérez, Antonio Benítez Pérez, María Núñez González, and Vicente Pérez Díaz, members of the Xi-Nich organization, Choles from the community of Viejo Velasco, Ocosingo, assassinated on November 13, 2006, at the hands of the Sectoral Police with high-powered weapons. *Héctor Regalado Jiménez, member of the Popular Assembly of the Pueblo Juchiteco, who died August 1, 2013, from wounds inflicted by the Industrial and Commercial Bank Auxiliary Police and gunmen from the Fenosa Natural Gas company, who acted as vigilantes for the wind farm. Pablo Jarquín Ruiz, Mixe, assassinated for denouncing the shots fired that scared the children in the community elementary school when the army entered their community on December 17, 2012. *Maximino Salinas Hernández, president of the Ejidal Authorities of his community, Fuerza Chinanteca Kia-nan, in San Antonio Las Palmas, Jocotepec, assassinated June 30, 2013, two months after his community detained municipal machinery in order to demand public works projects. *Carlos Sánchez López, assassinated on August 8, 2003, in Juchitan, Oaxaca, and Manuel Posada Chévez, assassinated April 5, 2004, in Unión Hidalgo, Oaxaca, in the context of the struggle of the Concejo Ciudadano Unidalguense against the Puebla-Panama Plan and the corruption of the PRI town councilperson Armando Sanchéz. *Aristeo Flores Rolón and Nazario Aldama Villa, indigenous representatives from the Nahua community of Ayotitlán, Sierra de Manantlán, who were members of the Consejo de Mayores, Traditional Authorities of the Sierra de Manantlán, and who were assassinated in September 2001 and May 2003. *Juan Monroy and José Luis Rosales Conteras from the Highlands communities of the Nahua Ejido of Ayotitlán, in the Telcruz district: Persecuted and shot for defending the organization against excessive logging in the zone. *Diego Ramírez Domínguez, Simón Pineda Verdía, Simón Pineda (his son), Quintín Regis Valdez, Erik Nemecio Domínguez, Ernesto Nicolás López, Pedro Nazario Domínguez, Pedro Guzmán Ramírez, Ambrosio Verdía Macías, Francisco Verdía Macías, Pedro Leyva, Isidro Mora Domínguez, Feliciano Cirino Domínguez, Jonathan Verdía Gómez, Fortino Verdía Gómez, Nicolás de la Cruz Rojas, Rafael de la Cruz, Juan Faustino Nemesio, J. Trinidad de la Cruz Crisóstomo, Crisóforo Sánchez Reyes, Teodulo Santos Girón, and Feliciano Corona Cirino, assassinated between 2008 and 2013, from the Nahua community of Santa María de Ostula, Michoacán. For all of them, we demand JUSTICE! *Celedonio Monroy Prudencio, Nahua from the community of Loma Colorada, from the Nahua ejido of Ayotitlán, Sierra de Manantlán, Jalisco, who was disappeared from his home by alleged ministerial police on October 22, 2012. *Agustín Mancilla Partida, Nahua, disappeared in October 2012 in the Nahua community of Villa Purificación. *Javier Martínez Robles, Gerardo Vera Orcino, Francisco de Asís Manuel, Enrique Domínguez Macías and Martín Santos Luna, Nahua communal members from Santa Maria Ostula, disappeared on various dates between 2010 and 2013. *The Guzmán Cruz family, whose names are: Amafer, Solón, Armando, Venustiano, and José de Jesús Guzmán Jiménez, disappeared on July 24, 1974, persecuted for their political militancy, in an operation in which the Mexican army entered the Purépecha community of Tarejero, Zacapu municipality, Michoacan, and took the family. *Teodulfo Torres Soriano, indigenous migrant from Oaxaca, was disappeared between March 23 and 26, 2013, because he was the primary witness to the attack and later death of Juan Francisco Kuykendall on December 1, 2012. *Flabio Granado Llanos and Cornelio Viberos Venabidez, originally from San Francisco Agua Fría in the Tatahuicapan municipality, coming from San Antonio and disappeared as of December 21, 2012. They were taken alive, we want them back alive! *Alejandro Regalado Jiménez, Binnizá from Juchitán de Zaragoza, imprisoned since April 3, 2013 and sentenced to 10 years in the Tehuantepec prison, detained for his Zapotec indigenous identity and for living in the seventh section of the town where the Popular Assembly of the Juchiteco Pueblo (APPJ) defended the land, territory, and air against the invasion of the Bii Yooxh’o windfarm by the Spanish company Fonesa Natural Gas. *Álvaro Sebastián Ramírez, Justino Hernández José, Eleuterio Hernández García, Abraham García Ramírez, Zacarías Pascual García López, Agustín Luna Valencia and Fortino Enríquez Hernández, Binnizá indigenous people from San Agustín Loxicha, teachers and peasants, guardians of their communities, detained 18 years ago and sentenced to between 20 and 30 years in prison. *Pablo López Alavez, Binnizá indigenous from San Isidro Aloapan, imprisoned in the Villa de Etla prison, kidnapped in 2012 by alleged furniture manufacturers and then appeared in that prison. Defender of the forests, territory, and natural resources from his community. *Dionisio Tapia Isidro, Sixto José Miramar and Filomeno Ortiz Antonio, Mixe indigenous people from San Lucas Camotlán, Oaxaca, imprisoned merely for asking the Mexican army why they entered their community on December 17, 2012. *Enedina Rosas Vélez ejidal authority from San Felipe Xonacayucan, indigenous Atlixco Nahua, member of the People’s Front in Defense of the Land and Water of Morelos, Puebla, and Tlaxcala (FPDTA-MPT), detained last April 6, imprisoned in the regional CERESO in Atlixco, for defending and respecting the decision of her people against the dispossession of land for the Integral Project of Morelos (PIM) and denounced by the Italian company Bonatti. *Juan Carlos Flores Solís from San Andres Cholula, in the Nahua region of valle de Puebla, member of FPDTA-MPT, detained last April 7, imprisoned in CERESO regional of San Pedro Cholula for defending the rights of the people in the face of the dispossession inflicted by the PIM, denounced by the bad government of Rafael Moreno Valle, and issued two more arrest warrants: one for by the Italian company Bonatti and the other by the Federal Electricity Commission. *Alejandro Díaz Santís, Tzotzil from Mitontic, sentenced to 30 years in prison without having committed a single crime, and being held in CERESO number 5 in San Cristobal de las Casas. *Rubén Díaz Orozco, who has been in prison for 17 years for being a social leader, held in the CERESO in San José El Alto, Querétaro since March 1998. The compañero is about to turn 70 years old and has serious health problems. (We demand his release because of his age and severe health problems). 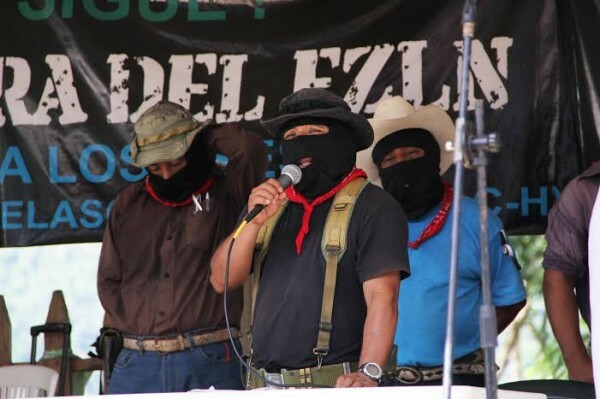 *Rómulo Arias Mireles, Pedro Sánchez Berriozabal and Teófilo Pérez González, defenders of water from the Nahua community of San Pedro Tlanixco: sentenced to 54, 52, and 50 years in prison, respectively. Lorenzo Sánchez Berriozabal, Marco Antonio Pérez González y Dominga Martínez González, who are currently under process and imprisoned in the Santiaguito penitentiary, Almoloya de Juarez, for struggling against the dispossession of water from the slopes of the Xinantecatl volcano for major commercial flower companies. *Mariano López Gómez, Raymundo Regalado Jiménez and Carlos Sánchez Martínez, members of the Popular Assembly of the Juchiteco Pueblo, who were accused of fabricated crimes and have to live on constant alert, denounced by the transnational wind company Fenosa Natural Gas. *Avelino Velazques Tapia, Eusebio Aguilar Torres, Alejandro Torres Chocolatl, Adela Ramos Villalba, Juan Álvares Tapia, Federico Villalba Ramos, Nahua indigenous, members of the People’s Front in Defense of the Land and the Water of Morelos, Puebla, and Tlaxcala FPDTA-MPT, denounced by the Federal Electricity Commission for defending the land and the water in opposition to the Morelos Integral Project. *Cirilo Rojas López and Casiano Pérez Magallón, Jorge de los Santos Pérez, Vicente Paredes Perales, José Abraham de la Rosa Sanabria, Ismael de los Santos González, Petra Sanabria Claro and Manuel Alejandro Jacobo Contreras, inhabitants and communal members, all from the community of Coca de Mezcala de la Asunción, who have been unjustly denounced and persecuted by the invader Guillermo Moreno Ibarra since September 2011 for defending communal territory. Salvador de la Rosa Paredes, who was denounced and who is now being denounced again by the invader named above. *This past August 4, while we were having this exchange, 10 public functionaries from the Federal Institute of Communications (IFETEL), led by Raúl Leanel Mulhia Arsaluz and accompanied by two patrols and three trucks from the Federal Preventive Police, violently raided the facilities of Zacatepec Radio in the Nahua community of Santa María Zacatepec, in the municipality of Juan C. Bonilla, decommissioning a transmitter, two microphones, a transformer, a CPU and a console. Minutes later, eight men in plainclothes, white pants and shirts without logos, with an IFETEL badge as identification, and accompanied by three patrols from the Federal Preventative Police who blocked access to the street, threatened compañera María Eugenia Toxcoyoa, operator of Axocotzin Radio, of the Nahua community of San Bernardino Tlaxcalancingo, in the Municipality of San Andrés Cholula, demanding that she allow them to enter the radio facilities or else threatening to use the security forces; six men entered the facilities and damaged them, taking the transmitter, the monitor, three microphones and the CPU with all of the historic social and political memory that the radio had collected in Junta Auxiliar de Tlaxcalancingo. The federal government and the government of Rafaél Moreno Valle orchestrated these actions in an effort to stop the struggle of the people of Tlaxcala, Puebla and Morelos against the Morelos Integral Plan. * The commander of the community police of Santa María Ostula, Cemei Verdía Zepeda, whom they are trying to frame for attempted homicide in the struggle against dispossession of the land and natural resources. *Rey Pérez Martínez, ex-president of the Ejidal Comisariado of San Pedro Tlanixco, and Santos Alejandro Álvarez Zetina, against whom they have unleashed a systematic repression, raiding their homes late at night and who have not been able to return to their homes for 11 years. *Carmen Ruiz Martínez, member of the APPO who has received death threats via telephone by hitmen from the Fenosa Natural Gas company who tried to kidnap them. *Raúl Javier Gatica Bautista, Mixteco indigenous, exiled from the country because of constant death threats that he received for defending the rights of the communities who make up the Indigenous Popular Council of Oaxaca Ricardo Flores Magón (CIPO-RFM). Our rage was born from our pain, and our rebellion from our rage, and from our rebellion the freedom of the people of the world will be born. For the holistic reconstruction of our peoples! Never again a Mexico without us! Member collective of the Omni Commons. We support and share information about the building of autonomy in Indigenous Zapatista communities; and in Oakland, CA. Unless otherwise stated, content on this site is licensed under Creative Commons Noncommercial-Attribution-ShareAlike 4.0.